My obsession with bees started in first semester of my undergraduate. My project was centred around the European Honeybee hive that’s on the second floor of the Zoology Department. They are busy and focused little animals, more concerned about getting the sucrose reward than bothering about stinging you (which remains a fear for a lot of people i.e. my housemate who still shrieks in fear when a bee buzzes around his head… wimp). Then when I was at a Masters ‘meet and greet’ day, I met my supervisor who asked me if I was interested in beetles. I replied quite emphatically ‘NO’ but that I was in bees. So my project, uncovering what flowers bees rely on in the Victorian Alps, was born. I went up there last summer and trekked around the Alps in fields of flowers and chased bees. On a cold day I picked up a small native bee. As I warmed her on my palm she began to groom herself. I realised I was hooked. Native bee Exoneura bicolor on Scenecio pinnatifolius in Victorian Alps. Copyright Michael Nash 2013. Bees are incredibly important to ecosystems and to us because around 90% of flowering plants (angiosperms) rely on them for pollination to sustain their populations and genetic diversity. For most people when they think about bees, the European Honeybee springs to mind. But this bee was introduced to Australia some 180 years ago and probably had negative effects on native populations, as they are often bigger and more aggressive. Australia has a lot of native species. We have one of the most distinct families in the world with some 1500 species and many of them endemic. There are still some 400 species yet to be described, as many of our native bees are small and solitary. 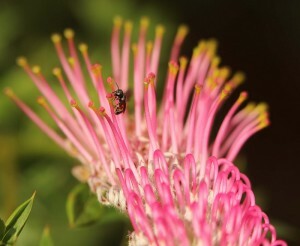 Small native bee on Grevillea acanthifolia. But why should we care about our native bees? Well although the European Honeybee is an important supplier of honey and of pollinating our crops, it is also in decline around the world. America has had commercial colonies disappearing because of colony collapse disorder (CCD), and last winter they lost one third of all their commercial Honeybee colonies. CCD is a result of multiple stressors on the bees such as pesticides, parasites such as the varroa mite (Varroa destructor) and viruses such as the recently discovered Israel acute paralysis virus (IAPV). These all interact to cause bees to disappear. These disappearances aren’t just occurring in the U.S.A. but even in Australia (see the previous posts: Bee grateful for bees by Thuy-Vivienne Tran and How to live without honey? by fabianac for more information on CCD and other issues). But the demise of the European Honeybee may not be a bad thing, especially for our native fauna and flora. The Honeybee has had wide ecological impacts in Australia. The Honeybee invades hollows in trees to make their hives, pushing native species like possums out. This is having negative effects on these native populations because Australia has many species that must have nesting hollows to breed. It also feeds of a lot of native species, such as eucalyptus flowers, but because the flowers have often co-evolved with native bees, it does not pollinate the flowers. This means that fruit are not formed and it has been a contributing factor to the collapse of the endangered species such as the swift parrot. We need to start understanding the sometimes vital roles that native bees play in sustaining native populations. These native bees can be even better pollinators than the Honeybee and they could be the species we end up relying upon to pollinate our crops. But more research is needed on our native bees! Below are a couple of the more common native bees in Victoria, so next time you’re in the garden you can keep your eyes out for them. 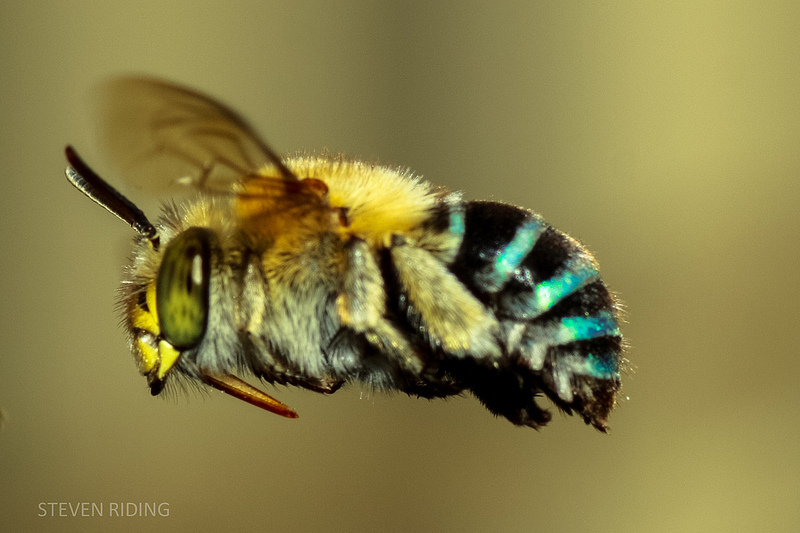 This bee is just over 1 cm in size, has a very furry golden head and thorax and a black abdomen that has very distinguishable bright blue stripes (though they can be almost white). It is a solitary bee, but females will often create their burrow near others. It loves blue flowers, so if you have lavender you may see it buzzing around! It lives from down in Tasmania, all the way up the east coast to the cape. 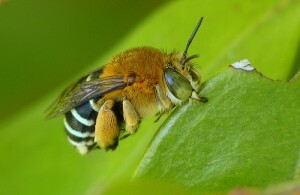 A male blue banded bee having a nap. A blue banded in flight, note the blue stripes. 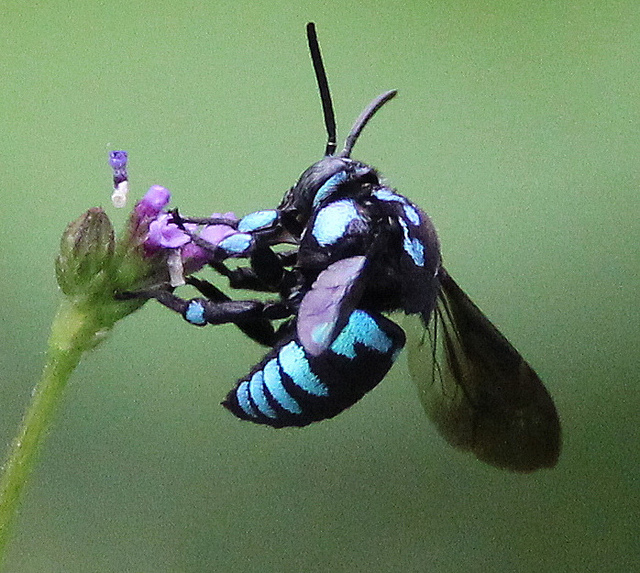 This is another distinctive bee because it has bright blue spots over its body. It does not make its own nest, but instead parasitises the nests of the blue banded. When the babies hatch, before the blue banded, they eat all of the pollen that the female blue banded has packed into the nest, and the blue banded babies die. They have a similar distribution to the blue banded bee (from Tasmania to the cape). 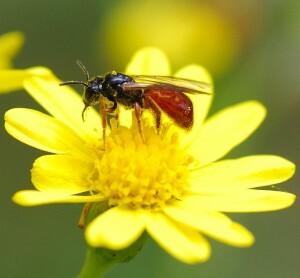 There are many other types of cuckoo bees in Australia, but the neon is in Victoria. A male neon cuckoo bee sleeping on twig. 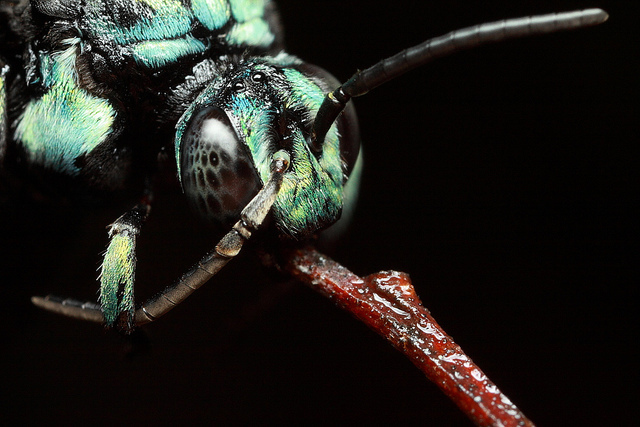 Neon cuckoo bee on flower. Goulson D. (2003) Effects of introduced bees on native ecosystems. Annual Review of Ecology, Evolution, and Ssytematics 34, 1-26. Engelsdorp D., Steinhauer N., Rennich K., Pettis J., Lengerich E.J., Taroy D., Delaplane K.S., Spleen A.M., Wilkes J.T., Rose R., Lee K., Wilson M., Skinner J. & Caron D.M. (2013) Winter loss survey 2012-2013: preliminary results, The Bee Informed Team <beeinfromed.org> 14th May, 2013. No I haven’t heard of them. They are beautiful! this is really great, my grandparents own a bee farm overseas and whenever over there I help them, but I didn’t know that there were so many different varieties and enjoyed reading about them all. Oh wow what an interesting post about bees! I didn’t know honey bees are damaging our native land in some aspects but thanks for sharing this information. No I haven’t! Their nests are beautiful. Thanks so much. Hi, Lucy. Thanks for sharing your research interest. I did not realise the difference between a commercial honeybee and the native bee. Lovely pictures you got there- I now know that bees come in a great range of colours and sizes. Lucy, your passion and enthusiasm for bees is contagious, and after becoming more educated about their role within an ecosystem (exclusively from you, in this post, a seminar you presented and in general conversation)I myself find myself more interested and attracted to an animal I previously spent little time concerned about. The role they playing in supporting endangered species, such as the swift parrot mentioned, is crucial and without your encouragement I wouldn’t of really understood the intricacy of the role they play in ecosystems. Thanks for the post – I love bees (despite being stung frequently as a child – my fault for playing in the bushes where they lived) and for a while I’ve been curious about our natives. Thanks especially for the pictures, they’re adorable!